Sun Yellow restaurant napkin bands to wrap with paper napkins- 2,000 Pegasus Ventures brand, 1.5" x 4.25"
Home >Napkin Bands > Sun Yellow restaurant napkin bands to wrap with paper napkins- 2,000 1.5" x 4.25"
Sun Yellow restaurant napkin bands to wrap with paper napkins- 2,000 1.5" x 4.25"
Our Pegasus Ventures Michigan brand self sealing sun yellow paper napkin bands wrap around restaurant silverware using a food safe adhesive, as recommended by the US Food and Drug Administration and required by many local health departments across the country. 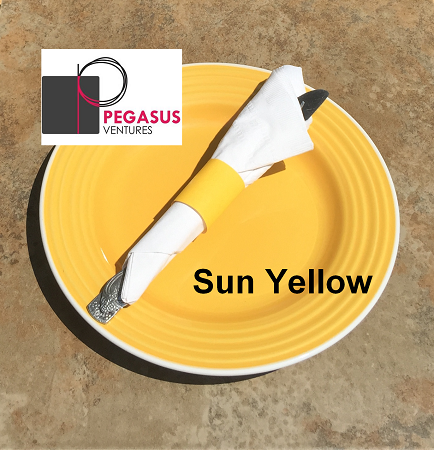 These Pegasus Ventures Michigan brand restaurant napkin bands are 1.5 inches wide by 4.25 inches long sun yellow napkin bands, for wrapping your restaurant's silverware, function best when using paper napkins. Pegasus Ventures Michigan customers know these quality napkin bands, for wrapping utensils, self seal and quickly roll ready to use with your restaurant's paper napkins. Try wrapping your restaurant's silverware in advance to make for faster table turnover. Using napkin bands to wrap utensils means customers appreciate the the awareness to hygiene as your wait staff add and remove wrapped silverware from tables without touching utensils with their hands.